Forget your anniversary, at your peril! This ring is called a chance ring. This ring says &apos;marry me&apos; and we can&apos;t decide if it&apos;s ugly or not. This is called a &apos;Bang Bang Ring&apos;. There are just so many jokes to be made here, we don&apos;t know where to begin. You&apos;re checking the balance on your secret credit card. Your wedding ring lights up. Brought to you by the boys from &apos;The Big Bang Theory&apos;? There&apos;s something quite symbolic about these rings...but let&apos;s not go there. You go nuts and he bolts? We may not have truly understood the nuts and bolts of this set. 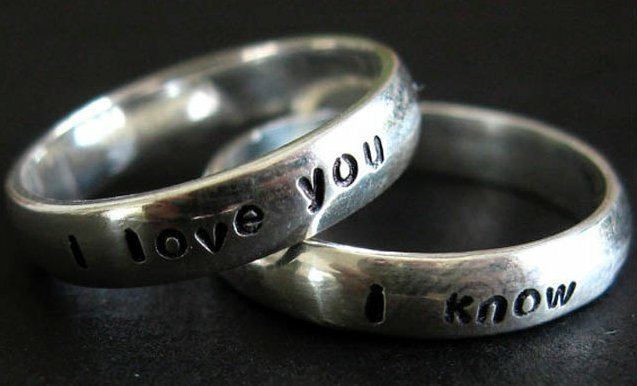 These Fingerprint Rings are as unique as you can get. Your fingerprint is yours and yours alone. Try me? Don&apos;t mind if I do. We all like secretly trying on rings but this one in particular will reveal what you&apos;ve been up to.